Dancing is an ancient ritual practice amongst earth honoring people. For thousands of years, we have gathered, celebrated, mourned, given thanks, prayed and journeyed through dancing. In a contained space, without words, dancing allows us to commune with the deep waters of ourselves and others. If allowed, the body’s infinite wisdom can be felt. Our inheritance of distrust, disdain and shame of our bodies, can be healed. Dance offers a sensual, *based in the senses*, experience. This portal, allows us access to aesthetic rapture, our innate creativity, connection. It reveals our vulnerability and our power. It taps in and gives space to our deep need for emotional expression. With space to soften the mind’s rule, the body can communicate, express and reveal ourselves to ourselves. We are granted access into our more emotional and archetypal ways of relating in a more intuitive, empathic state. We can gain access to our Souls. Our emotions have space to be felt, flow through and are moved through our bodies. Our unconscious may become conscious. 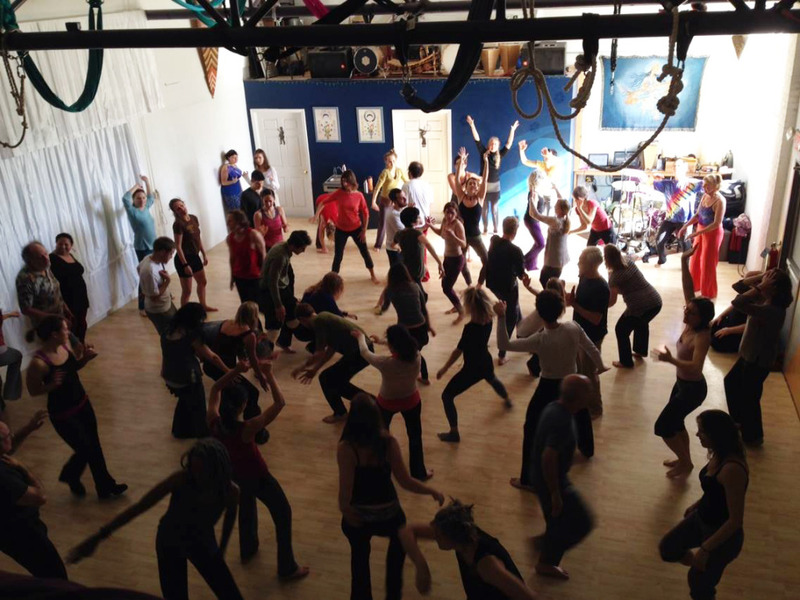 With the support of community, dance can take on an even deeper, profound, ancient power. The container of a group of trusted people can hold space for deeper expression, inspiration, safety. On the flip side, we may also find our boundaries as we meet others in this state. Our wounds may be revealed, or triggered, in this communal practice. And this is can be a gift. From there, we have space to heal. As we gain safety & establish trust with others, our boundaries may even shift briefly to commune with the collective, transpersonal Oneness. This notion of being ‘out of one’s mind’ or ‘outside oneself’ has become unfortunately demonized, just as dance itself over many centuries. Yet, we continue to commune and be moved by pounding drums or electronic beats and reclaim our right to dance. Letting the mind rest, to stand outside of one’s usual proper egoic state for a brief communion with body, has granted me access to realms of myself previously unseen and unexpressed. The practice as midwifed new parts of myself into being and helped me find healing, nourishment, trust and connection. As we heal this tragic inheritance, separation from our own bodies, we may find the path to our Soul’s longings and purpose. Sometimes, is through the body that we receive these messages, when we remember how to listen. Julia has been facilitating and weaving music for Ecstatic Dance at the Flowjo twice weekly since 2011, shortly after The Flowjo opened. Each dance is 90 minutes with time allowed for opening & closing circles. DJs rotate. This twice-weekly dance seeks to offer safe, sacred space where we can move, express, connect and heal within the container of community. Our Ecstatic Ritual has been dancing regularly since March 2011 creating a web of connections, trust and support. Julia facilitates ED at Flow & Hoop Dance retreats including Hoop Convergence, Sacred Circularities, Return to Roots, Embody and is offering courses for dancing in community for children & adults. Contact Julia to set up a special dance-based workshop.